"If you were at our January Business meeting or read the minutes, you should be aware of several changes being made to keep part of racing and Solo II's less expensive for some competitors...For Solo II, each class is now broken into three groups as 1) Stock (Showroom), 2) Prepared Stock, and 3) Modified. The ladies will run against the men on an index." Regional Executive Hank Ellett penned in the February, 1972 Gazette. Hank added in the April, 1972 Gazette, "We still have many problems facing us, one of which is a permanent place to hold gymkhanas. Until then, the Solo II Committee will be conducting an extensive search for temporary places." By the end of the year, 57 region members had earned points in seven Solo II events that were held at Shepard Mall, Trade Mart (SW 74th and Penn), Stillwater, Enid, Ponca City and two events at Tinker Air Force Base. A Gymkhana Auto-Cross will be hosted at Tinker Sunday by the Junior Officer Council in conjunction with the Oklahoma Region Sports Car Club of America, Inc. Gymkhana Auto-Cross events test driver adaptability and car maneuverability, rather than speed. 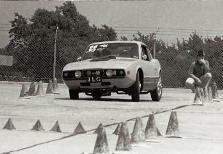 A stock street sports car is used to run the events, which test the driver and the car, one at a time, against a clock. Trophies will be awarded to winners. 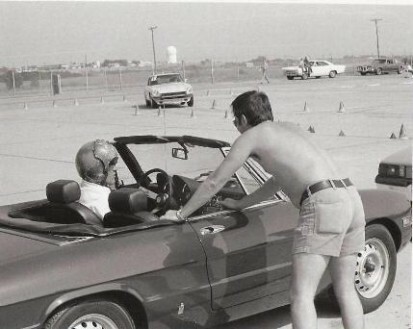 According to 1st Lt. Mark Lacaillade, Athletic Chairman of the council, Gymkhana Auto- Cross events have direct application to handling a car for highway driving. He added that this is testified to by the fact that police driving schools are, in effect, gymkhanas. Carol Cravens hustles her Corvette to first in Ladies A at the July 16, 1972 Tinker AFB Solo II event. 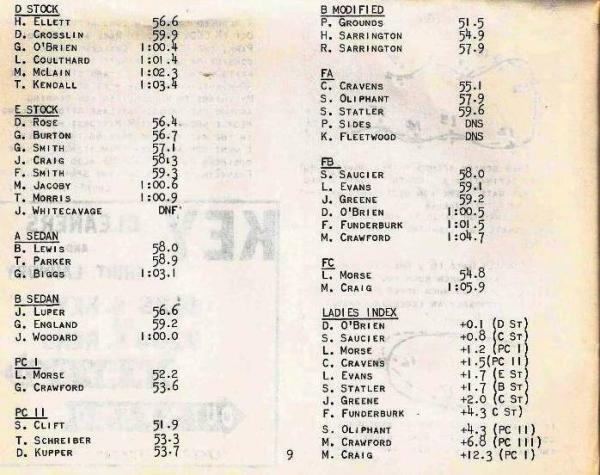 She also finished 12th overall out of 71 entries, but lost the year end Ladies A title to Linna Clift, also in a Corvette. The event will be open to all military, and civilian sports car owners. Military and civilian participants may bring guests as spectators. Entry fee will be $1.50 for Sports Car Club of America members, $1.50 for military members, $2.50 for member clubs and $4 for guests. Guest spectators will be admitted free. This event will be held east and south of Bldg. 2122 and entrance to Tinker will be through Gate 20 on South Douglas Blvd. Registration and practice will be from 9 a.m.-12 p.m. and the timed runs will be held from1-6 p.m. Results for this event are posted below. Please note the Gazette in 1972 rarely posted the make or model of cars, so the captions in the photo gallery of this event may not be totally correct. Your editor apolgizes for any errors and pleads for corrections.